J.C. Newman Cigar Co. has turned to its long-time partners the Fuente family to procure some exclusive tobaccos for its long-awaited Diamond Crown Black Diamond cigar, which debuts next week during the IPCPR trade show in Las Vegas. The new blend is limited in production and will only be available at select Diamond Crown Cigar Lounges. "The tobacco grown for the filler and binder of this cigar comes from one of the far corners of the Fuente farm in the Dominican Republic that has never been used in any other cigar before," said Eric Newman, president of J.C. Newman. He's referring to Chateau de la Fuente, known for growing the wrappers found on Fuente Fuente OpusX cigars. According to Newman, Black Diamond's dark, Cuban-seed sun-grown wrapper was grown in Connecticut and aged for eight years before an extended fermentation. The blend was chosen with input from both the Fuentes and Newmans, as well as a select group of retailers and enthusiasts. "Carlos Fuente Jr. and Carlos Fuente Sr. worked with the Newmans to develop a couple of different versions of this special cigar, and we smoked them," Newman said. "We shared them with our best customers and some very lucky consumers who attended our Diamond Crown Experience trip to Tampa." Black Diamond will come in three sizes: Emerald, measuring 6 inches by 52 ring gauge; Radiant, 4 1/2 by 54; and Marquise, 5 1/4 by 56. The cigars come in black, lacquered humidor boxes of 20 and will carry suggested retail prices from $17 to $20 per stick. 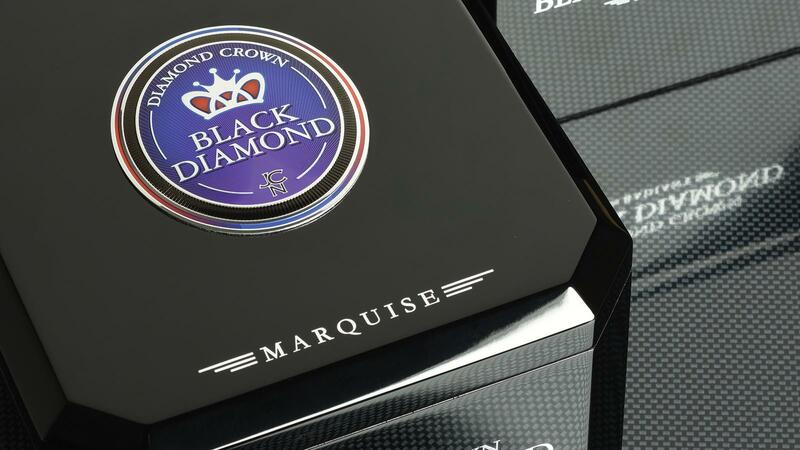 Black Diamond was supposed to ship last year after sample versions of the blend were passed out during the 2015 IPCPR trade show in New Orleans. Now J.C. Newman says it will be officially unveiled at The Diamond Crown Crowning Party at TAO in Las Vegas and is expected to arrive at select retailers starting in September. J.C. Newman confirmed with Cigar Aficionado that Black Diamond's blend has not changed since the samples appeared at last year's show. This article first appeared in the July 19, 2016 issue of Cigar Insider.